Print ties are woven before the silk is dyed. The undyed silk is sometimes woven with a simple texture which is referred to as a jacquard or twill. It is then colored by printing a design on it. Typically print ties are lighter in weight than their woven counterparts. Satin ties utilize a weaving technique that creates a high sheen finish. They can be either woven or printed. The Four-in-Hand knot is by far the most popular. It can be worn with any type of dress shirt collar and it requires less “tie length” to execute successfully which makes it particularly suited to thicker woven neckwear. The Windsor and Half-Windsor are fuller knots. They are most appropriate with wider spread collar dress shirts. Learn more about how to tie a tie. Neckties are available in virtually every color and pattern imaginable and the rules are few. Novelty ties are fun but generally not appropriate in more traditional business environments. Repp stripes, subdued paisleys and smaller dot patterns are all classic, more appropriate choices for the office. The color in your necktie is the perfect way to add some energy to classic business attire. Matching your tie with a solid dress shirt is easy. 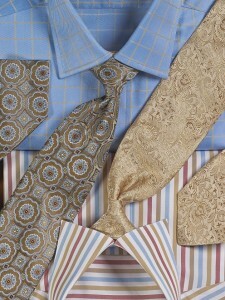 However, even though a patterned shirt is a little more limiting, there are still ample neckwear options. 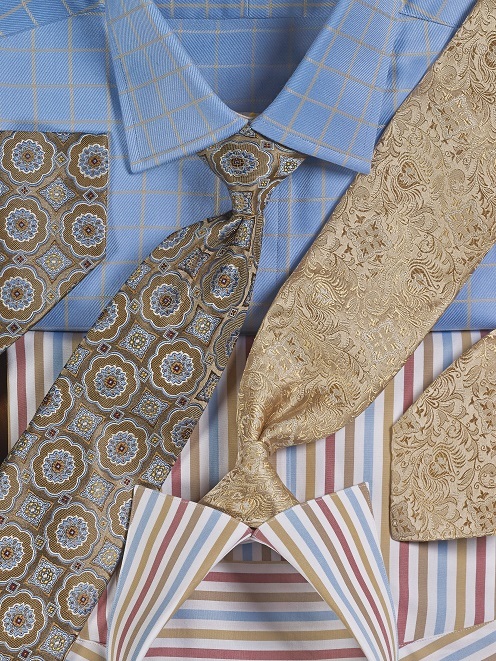 Our rule: Combine a large patterned tie with a small patterned shirt and vice versa. For example, if you are wearing a bold striped dress shirt, pair it with a pin dot necktie. Or, use a bold paisley necktie to complement a tattersall check dress shirt. I have to admit, even though I knew there was a lot going into choosing a tie, I had absolutely no clue what on earth it was. This is a very informative blog post. Thank you for your feedback, Kyle! We are glad that you liked the post! I would like to see a more in depth “All about Men’s Ties”. There is always more that I can learn and I am sure that there are others who feel the same. For example, mixing a striped shirt with a striped tie should be well thought through. Of all the photos in your current collection, only two examples of mixing stripes are shown. The above rule of mixing a large pattern with a small pattern is very good, but more care should be given to mixing stripes in my view. I would be curious what your sales statistics show in regards to customers purchasing a shirt and tie together as shown in your catalog and website. Below is the link to an article that you may find helpful. Your comments have been forwarded to our Merchandising Department and will definitely take this under review. Hopefully, we can show other examples of matching patterned dress shirts and ties in future catalogs. I need to learn how to tie my tie differently than just the Windsor! Nice guidelines, though. I have a comment related to the tie and that is the “tie bar”. I see many young men wearing the tie bar up on their chest. It should be worn about mid tie and it’s worn that way not only for looks but for its practicality. The Doouble Breasted Suit does not need side vents. It has has them in the past, but to give you a more tapered and refined look, keep the vents closed! With the extra material of the Double Breasted Suit, the closing of the vents doesn’t allow flappy material to be blown like a flag, nor just a sloppy look period. My Opinion, if you want vents, have your tailor give you vents as I do when I don’t want them, I have them closed and look sharp! We always strive to offer our customers the best in style, comfort, fit and value. In order to maintain those principles we continually reevaluate our offerings, and we will take this feedback into consideration for future collections.